Not much of an artistic photography, but it is the great heritage of the Israeli Air Force! This is a great museum, presented in a beautiful gallery. A must visit for whoever interested in the history of the Israeli Air Force history. Sorry if this has been asked before but I wish to do a model of a C-47 Dakota from 1996 that had all the cluster antennas along the top of the fuselage as well as the other antenna along the top and bottom of the aircraft, could you help with were they were located or point me in the right direction? Excellent pictures.Israel is so sucsessful militarily due mostly in part to the God of Abraham, Isaac and Jacob in accordance to the promises He made long ago! Studying the Israeli history and watching these photographs, it confirms thoroughly the historical excellent reputation of the unbeatable Israeli air force. Hopefully the surrounding Islamite countries in the Middle East will realize that by attacking Israel, theyll commit suicide! to a bomber and we managed to chase an egyptian war ship which approached Tel Aviv ? Where could i find the original aircraft fleet from the year of 1948 which included austers, rapid, and the V Tail Beech craft. Maravillosas fotos con detalle, variedad de ángulos, y calidad de resolución. Casi no es necesario ir al museo para verlos en persona. Aunque con tantas joyas, es dificil no plantearse visitarlo. Gracias por tan bonito reportage. can you show me a photo of the Airforce flyover of Auschwitz? Would someone please let me know where I may purchase a photo/poster of the IAF over Auschwitz? Thanks to all! God (the one true) bless Israel ! Do you have a DC-5 in your stable of old aircraft? I would like to have a photograph of the Israeli Air Force Flying over Auschwitz' How can I buy one ? I am a Hungarian survivor. All my relatives were murdered there. where would I purchase a photo of Israeli planes flying over Auschwitz? I saw the photo in the Israel Air Museum. Being an old fighter jock, I loved this gallery. Nice gallery. A tribute to a great Air Force. Very nice gallery! The Israelis has some real firepower! Excellent images with great perspectives! Thanks for the Super Mystere intake duct photos. I needed to see this to build the Airfix 1/72 scale Super Mystere kit. Your site was the only one I found to have the photos I needed. 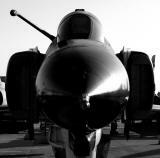 The best air force in the WORLD!!!!!!!! Best pilots!!!! Nice pictures. I went to this museum in 1995. At the time they had a bird that has been in the raid in Entebbe!